$8.91 to buy a 3 day trial subscription. $34.95 to buy a 1 month subscription. $83.97 to buy a 3 month subscription. $119.94 to buy a 6 month subscription. Home: This is the homepage of the site. Search: Look for women through the search options. Messages: Read and send emails through the messages section. SMS/Text: Read and send SMS text messages to other members. Newest: Check out the newest members of the site. Friends network: Check who is in your friends network. Favorites: Add your favorites members and find them in your favorites. LocalBlackMilfs.com is a new dating site that hooks up men with older mature black females. For this investigation we created a free basic account and the results of our review are available below for you to read. Fictitious Automated Messages From "Online Cuties"
Even before you can create a free account on LocalBlackMilfs.com you need to agree to the terms and conditions (see evidence below) and you need to agree to the use and nature of "Online Cuties". But what exactly is an "Online Cutie"? The site describes an "Online Cutie" as a fantasy profile. If something is a fantasy it means it is not real. 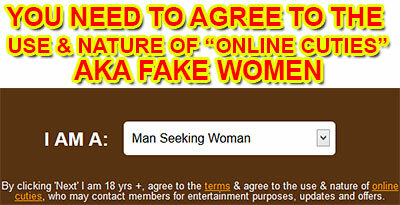 So you need to agree to the site's use of fake dating profiles. Unfortunately most people don't even see what's right in front of her eyes so without even reading that text they create their free profile on the site and then log in to the members area. What most people don't understand or fail to realize is that almost every single profile on this site is an "Online Cutie" making all the female profiles completely fictitious. So what you're looking at is an online image gallery and not a real dating site. Fake Profiles AKA "Online Cuties"
Below as evidence is just one example of the multitude of fictitious dating profiles that are under the umbrella of "Online Cuties". Every single profile we reviewed was an "Online Cutie" signified with a yellow star with the letters OC (see evidence below). This website does not hide the fact that they use "Online Cuties" throughout the site. You need to sign up and register and you need to agree to the terms and conditions on the nature of "Online Cuties" before you even get access to the members area. It's right in front of your face. We are not condoning the actions of this site, far from it. This site is involved in fraud and deception and should be held accountable. But at the same time you have to take some responsibility if you plan on using any product or service. So to be 100% clear everything you see in a profile on this site is fake, from the photographs, age, location and everything else you would see in a legitimate profile is completely fabricated. You have no idea if you're interacting with a real person or an "Online Cutie", if you don't lo don't know what you're looking for. The yellow star with the letters OC signifies that the profile is a fake dating profile. "OC" aka "Online Cutie" logo circled in red. Fake Emails From "Online Cuties"
All the email messages we received were from "Online Cuties". The emails are completely automated and no real women are sending us e-mail messages. This con is used to lure free members into upgrading. If you look at any email messages you receive you need to upgrade in order to read those messages. Of course upgrading means pulling out your credit card and paying for a monthly subscription to the dating service. Unfortunately there is no use in upgrading since the emails are totally fake and sent from fake women. This is part of their fraud attempt to trick you into giving them your credit card information so they can start making money off you every single month on recurring monthly subscrption charges. The site even admits to hiring people as part of their "Online Cuties" program. These third-party contractors are employed to string you along and build up trust with you in the hopes that you will want to purchase a paid membership and continue paying for a monthly subscription to the site in order to interact with these 3rd party contractors that you beleive to be genuine women. You may think you're chatting with the girl of your dreams but it could very well be someone who is paid by the site to pretend to be interested in you. To end our investigation of LocalBlackMilfs.com, we have included the most important parts of the terms and conditions which clearly outline and describe what "Online Cuties" are. This was taken directly from the site where they admit to the use of fake dating profiles, automated messages and hiring people to string you along! THIS SITE UTILIZES FANTASY PROFILES IDENTIFIED AS ONLINE CUTIES. You comprehend, acknowledge, and accept that some of the profiles listed on the Site may be operated by our Site or third party contractors and are fictitious. These profiles and interactions generated from them are clearly labeled with the Online Cuties logo: . Interactions originating from Online Cuties functionality could be computer generated or could be created by the Site or third party contractors hired by the Site. You comprehend, acknowledge, and agree that the interactions, profile information, and content utilized by Online Cuties profiles do not originate from any actual Site member, but are present for educational, entertainment and Site monitoring purposes only. Any similarity between Online Cuties profile information or interactions to any real person is purely coincidental and fictitious. Staff of Site or third party contractors hired by the Site could operate multiple Online Cutie profiles and associated communications features. You further comprehend, acknowledge, and agree that, Online Cutie profiles may contact both free users and paid users with computer or human generated interactions for the purposes listed above. These interactions may be initiated to several users simultaneously or in a small time frame. You comprehend, acknowledge, and agree that no in-person meeting will ever happen between You and the people providing Online Cuties functionality, and that the interactions You have via Online Cuties functionality is for entertainment purposes in addition to encouraging participation in our Service and to help monitor use of the Service. If you like interacting with phony women by all means use LocalBlackMilfs.com. If you want real women then this is not the place for you. If you want to search for real females, then look at these legit dating services. i want to change my profile # About Me; to all yuus beautiful young ladies out there to who it may concernlet let me be very brief and break it down to you a very short version about me i am a very hard working dependable man that enjoy and takes life very serious i'm a man that live life every day as if it was the last day on earth because i am definiitely not gonna sit back and just watch pass me by i don't know about you but i'm not so hhese are some of the things i love and enjoydoing i definitely love going on boat cruises which is something i do quite often definitely on a regular i also like going to the basketball games at the casinos comedy shows plays movies dinners and i definitely love cooking that is something i've been doing all my life besides driving trucks and i do hvve my own business as well selling food which is something i love to do also like taking long walks long drives like i said up above i enjay life as if it wasthe last day on earth thats the bottom line i love enjoying my life i have fun doing what i do and one thing for the like i seid i do value my life i'm definitely not in a rush to jump in to anybody pouch just like thats a no no i like communication and conversations because i definitely like to get to know at least a little bit about the i'm dealing with it is what it is oh don't get me wrong i can get down right dirty and nasts when it comes to love making in this and that i will blow your mind the thing is can you handle it because i'm a dangerous man when it comes to what goals in between the sheets trust and believe i will break your back but you know talk is cheap me personally i like to show and tell that's my M.O. This site is a rip off they got me but no more every month they're doing something to website. They want you to keep changing credit cards for tokens but they're declined so they tell you to buy another one. They're never responsible for their action just alot of smoke filled jive that just psssted me off. But brothers these cats are users to get you in and drop you like it hot, this site should be shut down for poor service to customers. The girls or women want to have fun I'm trying to get a date but they are so full of their selves it's a shame and most or married if he can't trust her how can i. Website just uses then black women and white women, girls go home stop this they're are destroying Americans and laughing all the way to bank. Not anymore from me.